Wagga Wagga Teachers' College (WWTC) was the first wholly residential co-educational tertiary institution on a single campus in Australia. With humble beginnings on the site of an old R.A.A.F. Hospital in suburban Wagga, for twenty-four years the College turned out fine young teachers, who enrolled from all over the State. This article Excel With Honour explores the experiences of the student teachers, and the impact which they, and the College had upon Wagga and district. 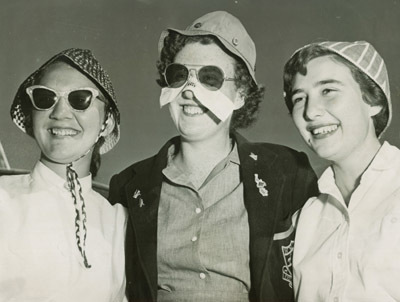 Through personal objects and evocative photographs, discover College life: the dormitories, food, sports competition, cultural activities and practice teaching. The Wagga Wagga community had been pressing for a teachers' college for over twenty years when, prior to World War II, the Copland Estate was chosen as a possible site. After the war however, this site was no longer appropriate as the Technical College and Wagga Wagga High School Farm now occupied a large portion of the land. The former site of the No. 1 RAAF Hospital near the Showground in the fledgling suburb of Turvey Park was therefore chosen. This provided Wagga Wagga Teachers' College (WWTC) with a 65 acre block upon which to establish itself. Students attended their first lectures at the new College on 9 June 1947, with the official opening a year later on 29 September 1948. Wagga Wagga Teachers' College was the first wholly residential co-educational tertiary institution in Australia. When the College opened, a total of 150 students was enrolled. The initial session (known as the "Pioneers") was drawn from all over the State, and included a number of ex-Service and mature-age students. By 1948 the Wagga Wagga Teachers' College campus comprised three blocks of women's dormitories, approximately ten male dormitories, three lecture blocks, gym, assembly hall, administration block, dining room and common room. The original dormitories were cream huts of timber and Masonite construction, with no insulation. Inside, students often baked in summer and froze in winter. These huts were linked by covered walkways, and the grounds were landscaped with attractive rosegardens. The men's and women's dormitories were well-separated. The men's dormitories comprised five rooms with three beds per room, facing a central ablutions block. Female students were housed in large blocks closer to the main College buildings. By 1955 with 280 students enrolled, the building of permanent brick residences, to replace the temporary buildings of the original College commenced. 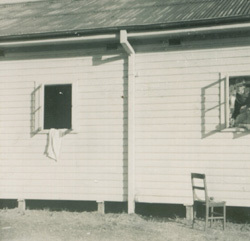 The first such unit, providing modern accommodation for 64 female students and wardens, was completed and ready for occupation in April 1957. More blocks followed in 1958, 1959, 1960 and 1962, when the second permanent brick residence for male students was completed. As with many institutions - whether boarding schools or tertiary colleges - to students who have passed through, their memories of the food served within are often unforgettable. Wagga Wagga Teachers' College is no exception. In the dining room, strict guidelines were adhered to. Hungry students massed outside the dining room doors, which were kept locked until the staff body arrived. Upon entering, students would wait for grace to be said before sitting down. Any latecomers would be expected to approach the staff table to make an apology, and occasionally, give an explanation for their tardiness. Tables comprised a mixed group of eight - four boys and four girls, whilst College staff was seated at a high table at one end of the room. Once placed at a table, students remained there for the duration of the year. Foods served up included lamb's tongue salad, sago pudding, corned beef and cabbage (with or without maggots!) Some dishes were given evocative nicknames by the students - there was Train (or Railroad) Smash - onions and tinned tomato with an occasional piece of meat, and Gluesclop (Blancmange). Students also supplemented their daily diet with food bought from the College Canteen, and the occasional food parcel from home. There was no refrigeration available in dormitories, so powdered or condensed milk was a must for those who wanted a late night cup of tea. Sport in many guises was an important part of life (and the curriculum) at Wagga Wagga Teachers' College. Over the years, the College nurtured competitive teams in Rugby League, Hockey, Table Tennis, Netball, Cricket, Tennis and Soccer. Ouside College life, teams from WWTC made an impact on the community at large. 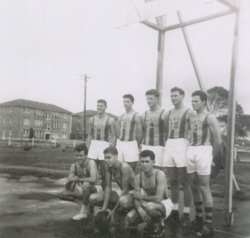 A student of the 1947-49 session was one of those responsible for starting soccer competition in Wagga, and the College team of 1948 captained by Kevin Quinn, were the District Soccer Premiers. 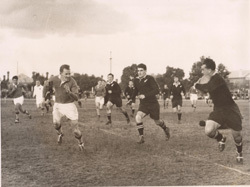 In 1951, a team led by former WWTC student Kevin Tye, and including students Bob Paton, John Rowlands, L. Slavin and Paul Butz formed part of the Riverina Representative Rugby team. They were unceremoniously defeated by the visiting New Zealand All Blacks, but as a sport, rugby was still relatively new to the Riverina. Inside the College, students participated in Inter-House games which occupied one afternoon per week. There was also physical education training and displays, and impromptu games like touch football and Melee (played in those early days on the College lucerne patch). Students also competed at Intercollegiate meets and at athletics and swimming carnivals. In the early days the latter were held in the pontoon baths located in the Murrumbidgee River, where competitors made heavy weather when swimming against the current. Fun was had at later carnivals which were held at the Wagga Pool complex. 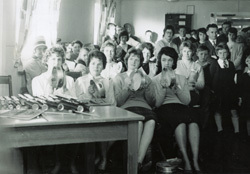 In the course of their studies, Wagga Wagga Teachers' College students were required to undertake two week sessions of practice teaching each year. Schools allocated to pupils included Demonstration Schools like Gurwood Street. Some schools were local: Turvey Park, Lake Albert Public, South Wagga, Gumly Gumly and Ladysmith, or further afield: Coolamon Central, Uranquinty, Lockhart, Narrandera, Junee, or Bullenbong Road (a one-teacher school). Students usually arrived at their destination by bus, though in some instances they were transported in a supervisor's car depending on local conditions. The teacher of the day had to be self-sufficient. So these student teachers arrived to learn their craft armed with lesson notes, observation books, teaching aids and an abundance of enthusiasm. Other teacher training came in the form of weekly visits to the Demonstration Schools for demonstration lessons. 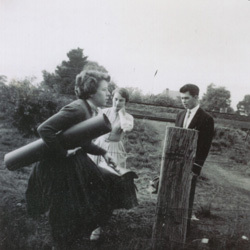 In addition to their practice teaching during the school term, students were also required to complete a 'home prac'. This was carried out at the beginning of the student's second year, at a school of their choice (usually near their home). By 1971 there were 450 students enrolled at Wagga Wagga Teachers' College. However, after twenty-four years of turning out fine young teachers, WWTC ceased to exist as a separate entity. Officially closing on Monday 11 December 1971, the College became the Riverina College of Advanced Education on 1 January 1972. The last graduation ceremony was held on 11 December. Former Principal G.W. Muir and Acting Principal R.E. Wade were present for the ceremony, and afterwards, the College flag was lowered by Alan Baptist and Jennifer Clark. The lecturers and staff walked out of the gates and they were closed behind. Thus started a new era of education. Upon graduating, former WWTC students were posted to schools all over the State. Destinations included Mortdale, Emu Plains, Tocumwal, Parkes, Tarcutta and Cobar. First schools varied - from larger Sydney schools, to small bush schools like Edith Public (between Oberon and Jenolan Caves), Talarm Public (where peanut bushes grew along the verandah), to the three room school at Tottenham (west of Parkes) or the Greta Migrant Camp No. 2. 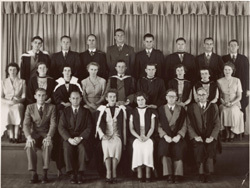 Other graduates continued on to further tertiary study at places like Sydney University, whilst others travelled to Puckapunyal for National Service training. The site of WWTC still remains today, and so do the memories.